Linux Mint isn’t chasing touch interfaces, rethinking the way we use the desktop, or enacting any other grand experiment. It’s just a polished, modern Linux desktop system—and that’s why people love it. Linux Mint 17.1 (codenamed “Rebecca”) is on the brink of being released, and it continues the Linux Mint mission of refining the interface we use every day. Technically, Linux Mint 17.1 is out in “RC” or “Release Candidate” form, which just means “this exact image will become the final release unless we find any huge bugs.” You can snag the RC images now or wait for a stable release, which should out soon. Installers with either the MATE or Cinnamon desktop environments are available. If you’re already using Linux Mint 17, you’ll soon receive a notification asking if you want to perform an upgrade to the new version. Got it? Good. Let’s dig in! Easy Compiz effects in MATE, finally! MATE is a fork of the GNOME 2 desktop environment once used on Ubuntu and other Linux distributions by default. It’s still popular among many people who don't see why we need new desktops like Ubuntu’s Unity or GNOME 3. Selecting Compiz options in Linux Mint 17.1. Back in the day, Compiz provided fancy graphical effects for GNOME 2 desktops. It can still do so for MATE, although many people had difficulties setting this up on Linux Mint. 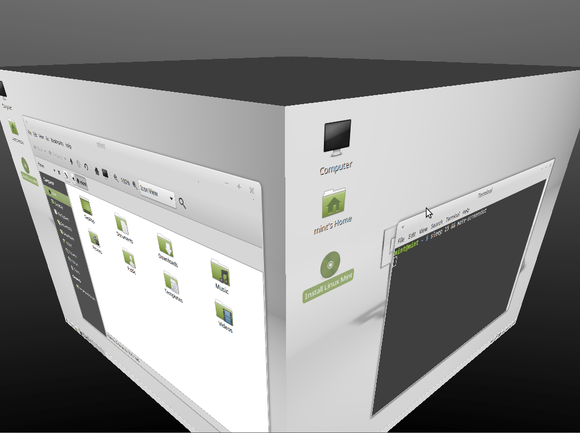 That’s why Linux Mint 17.1 includes easy Compiz setup. The Windows pane in the Desktop Settings window provides a box allowing you to choose between the stable-but-potentially-boring “Marco” window manager and the fancy-but-potentially-unstable Compiz window manager. Desktop cubes, wobbly windows, and more—it’s all back. The Cinnamon desktop was bumped to version 2.4. Unlike MATE, which is based on GNOME 2, Cinnamon is based on more modern GNOME 3 code, but it takes that modern code and forms it into a more traditional Linux desktop interface. There’s a lot of polish in the latest version to provide “smoother experience.” Thirty memory leaks were fixed in various components, which will reduce memory usage. There are new animations and some icon load times should be reduced. Various bits of the interface have been polished—settings in Cinnamon Settings are now sorted alphabetically, for example. 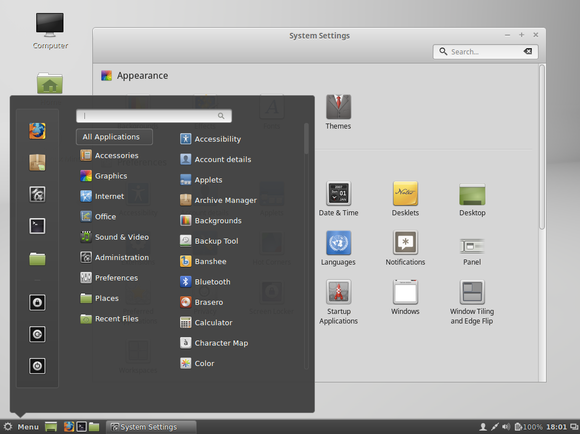 Linux Mint 17.1's Cinnamon desktop. The Theme settings were completely redesigned, and you can now use a slideshow as your desktop background. The Nemo file manager gains a button to quickly open a terminal window (hidden by default) and support for “emblems” that can be added to folders to make them more visually distinct. Various other changes affect both desktops. 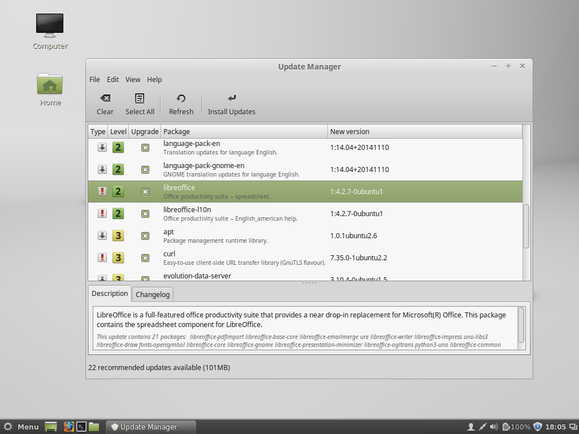 Linux Mint now uses the Noto fonts by default, and the default theme comes in many other color choices. The Login Window preferences were redesigned, and the Language configuration window now allows much easier installation of “input methods”— welcome news for people who need to write Chinese, Japanese, Korean, Thai, Vietnamese, and other languages where all the characters aren’t present on the keyboard for easy input. But perhaps the biggest change is in the Update Manager application. It no longer shows individual package updates, but groups updates by “source package.” This means that—for example—when an update for LibreOffice is available, you won’t simply see a list of 22 packages. Instead, by default, you’ll see a single “LibreOffice” update in the list, although you’re free to drill down if you choose. According to Linux Mint’s developers, installing some individual package updates but not others —for packages like Mesa 3D graphics library, for example—can sometimes break people’s systems, however. The refined Update Manager in Linux Mint 17.1's Cinnamon desktop. Going hand-in-hand with this change, there’s also a redesigned kernel selection screen that makes it easy to see available kernels along with information about security fixes and known regressions (problems in the new kernel, in other words). For a more in-depth look at the changes, check out the official lists ofnew features in Linux Mint 17.1 MATE or new features in Linux Mint 17.1 Cinnamon. Overall, this is exactly the kind of release I—and many other Linux users—like to see. While Ubuntu 14.10 just shipped with no visible changes besides version bumps in a number of packages, Linux Mint has made the choice to stick with Ubuntu 14.04 under-the-hood and modify the stuff on top. Linux Mint 17.1 provides a great Linux desktop system, especially if you long for the days of more traditional Linux desktop interfaces.